Chevron is a pattern name for a shape, pattern, or object in the form of a V.
The Chevron design style has been around since ancient times and can be found on rock carvings and pottery from as early as 1800 BC. It's been used in Heraldry, as military rank insignia, and on road signs for ages. It's also the name of an energy company. If you're interested, you can learn more about the history of this pattern at wikipedia or at ecosalon. Lately Chevron stripes have been showing up all over the place and they've become especially exciting on invitations. This chic zig-zag pattern pops whether it's being used as a border or background and in my opinion, choosing invites with these stripes is a sure fire way to let your guests know that there's fun in store at your upcoming occasion. You'll find trendy Chevron invites in every color of the rainbow, for any occasion and they look elegant in a cute way, if you know what I mean. In fact, the smaller the stripe, the more elegant they look, and the larger stripes make for more fun as shown on the following Chevron bridal shower invitations. If you're looking for one of the most popular invitation designs, Zazzle has you covered for any occasion. 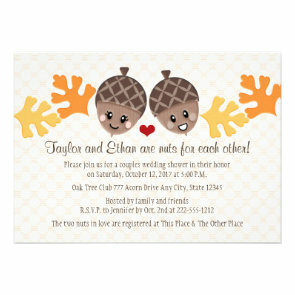 Start your search for Chevron pattern invites here. Tell us what you think of this stripey design in the comments below. Is it a passing phase or do you think it's here to stay for the long run?